The Toronto Blue Jays completed their sweep of the Texas Rangers with a walk-off win in the 10th inning and it came on a wild throw from the one player Blue Jays fans hate the most. With the score tied 6-6, the Blue Jays had runners on first and second with one out. Russell Martin hit a ground ball to shortstop that the Rangers had a chance to turn into an inning-ending double play. After getting the force at second base, Rougned Odor, who famously punched Jose Bautista in the face during an altercation earlier this season, threw wide to first base. While Mitch Moreland made a great play to block the wild throw, the throw was just wild enough that it allowed Josh Donaldson to scamper home from third base with the winning run. The Rangers tried a desperation challenge to see if there was interference at second base on the slide. 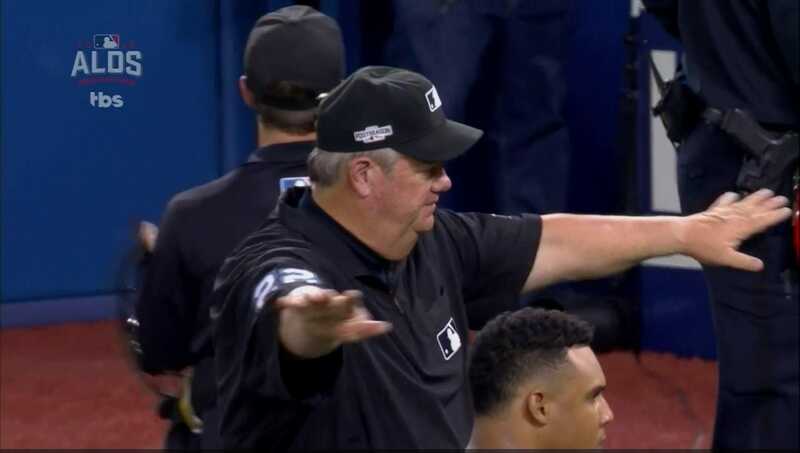 After looking at replay, umpire Joe West ruled there was no interference, the run counted, and the Blue Jays were on their way to the ALCS.